Johann Christoph Friedrich von Schiller (November 10, 1759 – May 9, 1805), usually known as Friedrich Schiller, was a German poet, philosopher, historian, and dramatist who became, along with his close friend Johann Wolfgang von Goethe, one of the influential figures in what would become known as the classical movement in German literature. Like Goethe, Schiller was a true embodiment of The Enlightenment, taking interest and making contributions not only to literature and philosophy, but also to science, history, politics, and the management of democratic societies. 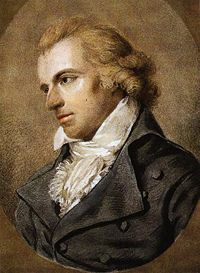 Schiller's views on liberty, equality, and civil justice, expressed so poignantly in his poems and plays and put into action in his philosophical and political writings, would have their influence on generations of writers in the succeeding decades of European Romanticism, as would his conception of the "beautiful soul." Schiller, living in one of the most productive intellectual periods in human history, synthesized the thoughts and sentiments of his generation and, while he is often criticized today as being too idealistic, he is nevertheless one of the most important figures in late eighteenth- and early nineteenth-century literature. Schiller was born in Marbach, Württemberg, a provincial town some miles north of Stuttgart. Schiller was the only son of military doctor, Johann Kaspar Schiller (1733–1796), and Elisabeth Dorothea Kodweiss (1732–1802). After retiring from military service, Johann Kaspar took an interest in gardening and horticulture, and he was appointed superintended of gardens and plantations at Ludwigsburg, the home of Duke Karl Eugen. For 13 years, Friedrich led a relatively happy life in Ludwigsburg, but upon completing grammar school, he was forced, at the command of Duke Eugen, to attend Karlscchule, a military academy which the Duke himself had founded. Johann Kaspar had hoped that his son might enter the ministry, and Friedrich himself loathed the idea of entering the notoriously harsh environment of the military academy—the Duke, however, was implacable, and in 1772 young Friedrich Schiller was enrolled. Schiller would endure the academy for eight years, ultimately studying medicine like his father. At age 21 he left for Stuttgart to take up a position as an assistant medical officer in a local regiment. Friedrich's early experience with tyranny at the hands of Duke Eugen solidified his own republican feelings, and his opposition to the aristocracy would find its way into much of his future work. Most notably, Schiller's first play, Die Räuber (The Robbers) addressed the topic explicitly. The play follows the descent of its protagonist, Karl Moor, the brilliant and ambitious son of a nobleman. Karl's deceitful brother Franz convinces their father that Karl is villainous and not to be trusted, and Karl's father promptly disowns him. Enraged, Karl becomes an anarchist, leading a band of thieves and criminals rampaging across the countryside. Ultimately, Karl realizes that anarchy is not an acceptable alternative to civil society, and that society cannot be reformed by violence. The play ends with Karl turning himself in and submitting to the laws he had attempted to overthrow. Although it has sometimes been interpreted as a morality play—with Karl stepping outside the bounds of society only to reject his criminal deeds and return to bonds of civil society—other critics both today and in Schiller's own time interpreted The Robbers as a tragedy of social injustice, depicting how a man of such intelligence could be driven to base violence and crime by an unjust society. The first performance of the play in the city of Mannheim on the January 13, 1789, rocketed Schiller to instant fame and renown. Radical intellectuals heralded the play as marking a major change in the German theater, where issues of social justice would be addressed directly. Conservatives and members of the upper-class, Duke Eugen among them, were scandalized by the work's revolutionary undertones. The Duke ordered that Schiller be imprisoned and forbidden from writing more plays. In order to escape this fate, Schiller fled to Mannheim, where he hoped the resident Baron von Dalberg would protect him. Dalberg, however, was under pressure from other members of the aristocracy, and not wanting to cause an incident, ignored Schiller's requests as much as possible. During this time Schiller lived in almost total poverty, but continued to write, penning the plays Die Verschwörung des Fiesko zu Genua (Fiesco, or, the Genoese Conspiracy) and Kabale und Liebe (Cabal and Love), the latter of which is now considered one of Schiller's finest romances. Eventually Dalberg was won over, and appointed Schiller as resident playwright of Mannheim's theater, but a year later he revoked his offer and Schiller was once again on his own. Schiller moved to Leipzig, where he began work on his epic poetic drama Don Carlos about King Philip II of Spain and his son, Don Carlos. Although its plot is complicated and overwrought, Don Carlos marks a major change in Schiller's writing, as well as German literature as a whole; the epic poem was one of the first popular works to introduce blank verse—that is, verse written to meter that is not rhymed—to a German audience. With this poem, critics now agree, Schiller first sounded the depths and complexities of character that he would later use to great effect in his mature masterpieces. In Leipzig, Schiller earned the patronage of a wealthy man named Christian Gottfried Körner. Overjoyed that he had finally found financial stability, Schiller wrote what is perhaps his single most widely-known work in commemoration of Körner's generosity, a short poem entitled An die Freude (Ode to Joy) that would later famously be set to music by Ludwig van Beethoven in the finale of his 9th Symphony. Ultimately, however, Schiller knew that he could not stay in Leipzig forever, which at that time was a cultural backwater in comparison to Weimar, Germany's undisputed literary capital. Schiller set off for Weimar in 1787, once again throwing himself into uncertain circumstances. In Weimar Schiller began writing works of history, and in 1794 he met Johann Wolfgang von Goethe by chance. Although Goethe's political and philosophical opinions were at that time almost antithetical to Schiller's radical views, the two became fast friends and would ultimately collaborate together on a number of projects. Goethe endorsed Schiller for a position as a professor of history at the University of Jena on the strength of two volumes Schiller had written on the history of the Thirty Years’ War. Schiller would remain teaching at Jena for a number of years, and would later use the materials he had gathered in his histories to form the basis of his greatest achievement, the epic drama Wallenstein. To Olympus where the blessed ones stay. Turn your head to the stars for direction. But don't trample the fruit of the garden. Nature's revenge will offer no pardon. Nature wills her continued survival. In 1800 Schiller finished Wallenstein, a work of an epic scale that is now considered one of the greatest works of German literature. The work, which consists of a preface in verse, a prologue in prose, and two five-act plays, depicts the life of Albrecht Wenzel Eusebius von Wallenstein, commander-in-chief of the Holy Roman Empire's armies during the Thirty Years’ War. Wallenstein is one of the first true antiheroes; a brilliant general and admirable man in all respects, he secretly plans to betray his country to the enemy in hopes of being appointed regent of the Empire. Wallenstein sees himself as existing "beyond good and evil," wishing to do what he does purely for the sake of his own will and desires. The play is a compelling account of the temptations of power, and Wallenstein's ultimate failure and death do not dispel the powerful questions on the nature of corruption and governance raised by the narrative. Realizing that his health was failing rapidly, Schiller entered a period of even more profound productivity after completing Wallenstein. Influenced by his long correspondence with Goethe, Schiller had come to greatly admire the classics of ancient Greek drama, and over the course of four years he wrote four plays modeled after the classics: Maria Stuart (1800) written on the subject Mary, Queen of Scots; Die Jungfrau von Orleans (1801), written on the subject of Joan of Arc; Die Braut von Messina (1803); and Wilhelm Tell (1804), which is concerned with a critical period in the ultimate downfall of the Hapsburg Empire. All of these plays were written on historical topics, and Schiller's time spent as a historian had clearly not gone to waste; in each of these plays he demonstrates a profound understanding of the historical contexts and issues at hand, as well as their relation to his own time. Although all these late plays are considered to be some of Schiller's highest achievements, Maria Stuart is singled out again and again as the first among equals. Chronicling the last three days of Mary's life before her execution, Schiller follows the classical method of writing his drama in medias res, beginning the play after most of the main events have already happened and allowing much of Mary's tragic history to be recalled through dialogue and flashback. The play demonstrates the profound danger for justice when courts and judges are subject to political pressure. Mary heroically accepts the decree of the English court that she be executed, viewing her own death as atonement for her own misdeeds in the past. The play is one of the best examples of Schiller's own theories of political and moral redemption through self-sacrifice. The play’s influence on subsequent European and Romantic drama has been unequalled. In 1805 death overtook Schiller while he was in the process of writing yet another historical play on a Russian subject, entitled Demetrius. Only fragments survive. Schiller was interred in Weimar, where he is remembered, along with Goethe, as one of the most influential Germans of his century. Schiller wrote many philosophical papers on ethics and aesthetics. He synthesized the thought of Immanuel Kant with the thought of Karl Leonhard Reinhold. He developed the concept of the Schöne Seele or "beautiful soul," a human being whose emotions have been educated by his reason, so that Pflicht und Neigung ("duty and desire") are no longer in conflict with one another. Thus "beauty," for Schiller, is not merely a sensual experience, but a moral one as well: the good is, fundamentally, the beautiful. His philosophical work was also particularly concerned with the question of human freedom, a preoccupation which also guided his historical researches, such as The Thirty Years' War and The Revolt of the Netherlands, also finding its way into his dramas (the "Wallenstein" trilogy concerns the Thirty Years’ War, while "Don Carlos" addresses the revolt of the Netherlands against Spain.) Schiller wrote two important essays on the question of the sublime (das erhabene), entitled "Vom Erhabenen" and "Über das Erhabene"; these essays address one aspect of human freedom as the ability to defy or surmount one's animal instincts, such as the drive for self-preservation, as in the case of someone who willingly dies for a beautiful idea. A pivotal work by Schiller was On the Aesthetic Education of Man in a series of Letters, (Über die ästhetische Erziehung des Menschen in einer Reihe von Briefen) which was inspired by the great disappointment Schiller felt about the French Revolution. He had hoped that it would be an American-style revolution, leading to the formation of a constitutional republic. Instead, it led to the Reign of Terror and Napoleon Bonaparte. Schiller wrote that "a great moment has found a little people," and wrote the Letters as a philosophical inquiry into what had gone wrong, and how to prevent such tragedies in the future. In the Letters he asserts that it is possible to elevate the moral character of a people, by first touching their souls with beauty, an idea that is also found in his poem Die Künstler (The Artists): "Only through Beauty's morning-gate, dost thou penetrate the land of knowledge." On the philosophical side, Letters put forth the notion of Stofftrieb ("the sensuous drive") and Formtrieb ("the formal drive"). In a comment to Immanuel Kant's philosophy, Schiller transcends the dualism between Form and Matter, from which the notion of Spieltrieb ("the play drive") derives, as are a number of other terms. Kant's The Critique of the Faculty of Judgment, the conflict between man's material, sensuous nature and his capacity for reason (Formtrieb being the drive to impose conceptual and moral order on the world), Schiller resolves with the happy union of Form and Matter in the "play drive," which for him is synonymous with artistic beauty, or "living form." On the basis of Spieltrieb, Schiller sketches in Letters a future ideal state (a utopia), where everyone will be content, and everything will be beautiful, thanks to the free play of Spieltrieb. Schiller's focus on the dialectical interplay between Form and Matter has inspired a wide range of succeeding aesthetic philosophical theory. Geschichte des dreissigjährigen Kriegs The History of the Thirty Years' War Retrieved July 22, 2016. George Steiner. Say it loud – it's Schiller and it's proud. Friedrich von Schiller. Letters upon the Aesthetic Education of Man. This page was last modified on 13 May 2017, at 21:01.